In Napoleon in America, King Louis XVIII at one point looks to his nephew, the Duke of Angoulême, for support, but is disappointed in the result. That about sums up the poor Duke’s life. Louis Antoine – to give the Duke his Christian name – was born August 6, 1775, the son of the Count of Artois and Marie Thérèse of Savoy. He is less well known than his cousin and wife, Marie-Thérèse, the Duchess of Angoulême, who was born at Versailles on December 19, 1778. She was the eldest child of Louis XVI and Marie Antoinette, and the only one of their offspring to survive the French Revolution. Marie-Thérèse (or Madame Royale, as she was then known) was imprisoned in the Temple, the remains of a medieval fortress in Paris, from August 13, 1792 to December 18, 1795, the eve of her seventeenth birthday. During this time her parents were guillotined and her younger brother – imprisoned in a separate room and neglected – died of illness. On her release from prison, Marie-Thérèse was taken to Vienna (her mother was a member of the Austrian royal family). She then joined her uncle Louis XVIII in exile in Mitau, in present-day Latvia, where he was living as a guest of the Russian Tsar. Louis XVIII wanted Marie-Thérèse to marry the Duke of Angoulême. She readily agreed, as it was a project her parents had favoured, though she could not remember ever having seen her cousin. They were married on June 10, 1799 at Jelgava Palace. The couple moved with Louis XVIII and the Count of Artois to Britain, until the royal family’s return to France in 1814. The Duke of Angoulême, who had entered service with the émigré army in 1792 (he led an unsuccessful royalist uprising in the Vendée) and commanded a regiment of Bavarian cavalry in the battle of Hohenlinden in 1800, sailed to Bordeaux in March 1814; the city had declared for the King even before Napoleon’s abdication. The Duke and Duchess of Angoulême returned to France after Napoleon’s defeat at Waterloo. The Duchess was tenderly attached to Louis XVIII, though she frequently disagreed with him. The Duke was more in sympathy with his uncle. To his family’s great pride, in 1823 Angoulême led a French invasion of Spain to restore a Bourbon cousin, Ferdinand VII, to the Spanish throne (that part of Napoleon in America is not fiction – read about the invasion here). In 1824, when Louis XVIII died and the Count of Artois became Charles X, the Duke became heir to the French throne (the Dauphin) and his wife became the Dauphine – the last one France ever had. The Duchess of Angoulême liked simplicity in her rooms and her dress. She banished from court the luxurious clothing of the Napoleonic period, preferring her ladies to wear simple white dresses. She did her own dressing and toilette, as she had done in prison. 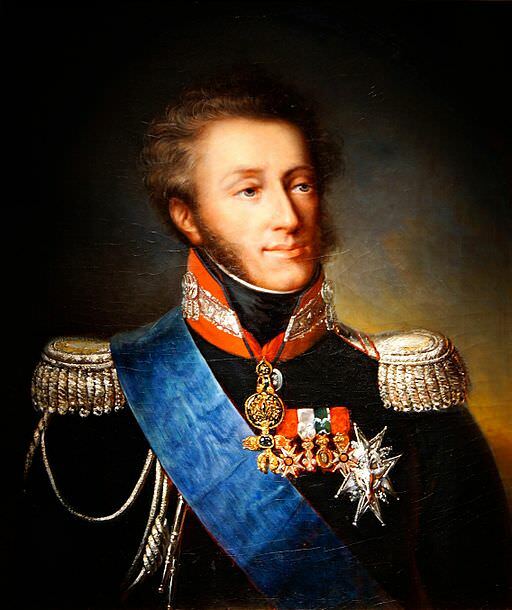 When Charles X lost his throne in the July Revolution of 1830, he abdicated in favour of the Duke of Angoulême. The Duke reigned for 20 minutes as King Louis XIX of France before abdicating in favour of his nephew Henri, the Duke of Bordeaux. Unfortunately for the Bourbons, the Chamber of Deputies pronounced the Duke of Orléans (Louis Philippe) their new king. Yet again the royal family went into exile. They lived first in Edinburgh, and then at the Castle of Hradschin in Prague, where they maintained the etiquette of the Paris court on a greatly reduced scale. I found him looking older and thinner. He was dressed in a shabby blue coat, buttoned high to the throat; it was too big for him and looked as if it had been bought at a second-hand shop; I felt terribly sorry for the poor Prince. The dinner was so meagre and ill-cooked that I rose from the table dying of hunger. It was served in her own salon, for she had no dining-room. After dinner, she sat looking out the window, commenting on the passers-by. The Duke of Angoulême died of sepsis on June 3, 1844 at the age of 68. After his death, the Duchess settled outside Vienna at Schloss Frohsdorf, where Napoleon’s sister, Caroline Murat, had earlier lived in exile. She spent her days walking, reading, sewing and praying. Her niece and nephew, Louise and Henri, on whom she doted, joined her there. She died of pneumonia on October 19, 1851 and was buried next to her husband in the Bourbon crypt at the Kostanjevica Monastery in Slovenia. Two months later, Napoleon’s nephew, Louis-Napoléon Bonaparte, staged a coup d’état in France. He went on to rule as Napoleon III. Just as theories swirl about Napoleon’s possible substitution and escape from St. Helena, there is a theory that the Duchess of Angoulême was secretly substituted for someone else on her trip from Paris to Vienna in 1795, laid out here. The Madame Royale Historical Society is trying to determine the truth of this theory through DNA testing of the remains of the “Dark Countess” (the alleged real Marie-Thérèse). You can read the Duchess of Angoulême’s memoirs of what passed in the Temple here. Joseph Turquan, Madame Royale: The Last Dauphine, edited and translated by Lady Theodora Davidson (London, 1910), p. 115. Susan Nagel, Marie-Thérèse, Child of Terror (New York, 2008), p. 157. George Muir Bussey, History of Napoleon, Vol. 2 (London, 1840), p. 516. François-René de Chateaubriand, Mémoires d’outre-tombe, Vol. IV (Paris, 1851), p. 161. François-René de Chateaubriand, Mémoires d’outre-tombe, New Edition, Vol. VI (Paris, 1910), p. 72. Turquan, Madame Royale, p. 332. Thank you for the insight. I am writing a book about the royal family and hope to have it published this year (2014). It should be an eye-opener for all, and I’ve decided that 100% of the profits will be donated to St. Jude’s Children’s Hospital. very interesting,didn’t know about it,will try to keep on ! !Know alot about this but did not know about the Duchess of Angouleme’s. Thanks, Diane and Bienvenida. The Bourbons are a fascinating family. Good luck with the book, Diane! Well, a little dissension is fine…I have even less sympathy for M-T as I have for Antoinette. She was no different from anyone else who suffered before and during the Revolution, and I just don’t see the fascination she seems to attract from some folks–being a “royal” without doing anything remotely useful or worthwhile doesn’t entitle her to adulation or admiration, or much sympathy. I read Vidal’s amazingly syrupy book, and Nagel’s somewhat more tolerable bio. Neither persuaded me that M-T is worth much interest. I’m amazed that there is a “society” dedicated to this woman, and is actually spending time and I assume money for DNA testing. Why on earth? Right up there with the dauphin smuggled out in a laundry basket, and the princes in the tower. Thanks, Margaret. Yes, Marie-Thérèse does seem to fascinate a lot of people. Probably has to do with being imprisoned as a child, though, as you say, many people who were not royals endured the same or worse. You are not doing the Duchess a favor. Her fate during the Revolution was terrible. There is even a rumor she was raped and infected with a certain disease. Unlike other victims she was constantly under scrutiny. She was so damaged she could not have entered into any normal relationship. Regrettably she was vindictive and called “Madame Rancune”.Her husband was indeed dominated by her but he was far more lenient in political manners. The Duke suffered from gout and had to be lifted upon a horse. And the Duke complained about his youth and said he was brought up in a nest of wolves. It is indeed known his mother lacked maternal feelings, unlike Marie-Antoinette.. Thanks for your comment, Johan. I agree, the Duchess suffered horribly as a child and, as you say, being under constant scrutiny made it worse. I feel very sorry for her, and also for her husband. Thank you But it is now clear their marriage was indeed consumated. 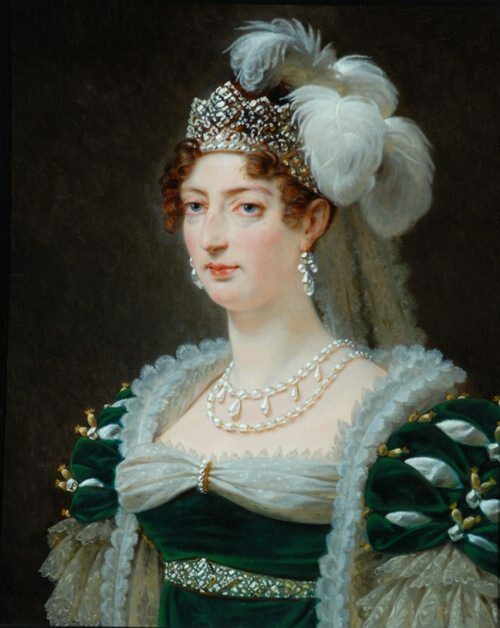 For in 1820 the Duchess mistakingly thought she was pregnant. A portrait of that time survives in which she poses in imitation of Gabrielle d’Estrées, mistress and even fiancée of Henri IV. Interesting! Thanks, Johan. I see there’s more about the pregnancy on Tea at Trianon: http://teaattrianon.blogspot.ca/2014/06/the-pregnancy-of-duchesse-dangouleme.html. Thank you for the link to my blog. I am very grateful. Of course, Marie-Thérèse suffered a great deal throughout the Revolution, not only in prison, but also on the several occasions when the mob threatened her family. It was especially traumatic for her as a child to see heads carried on pikes. But she was keenly aware that others had suffered as well, which is why she made a point of visiting Lyon and other cities and towns in France where the revolutionaries had massacred hundreds of people. It is also why the princess spent so much money on hospitals, orphanages, and on helping the poor. You’re most welcome, Elena Maria. Tea at Trianon is a wonderful resource for anyone interested in Marie-Thérèse and her family. She was very generous and devout. [T]he couple had become august not only by sorrow nobly borne, but also by the strength of the bond between them, which included absolute leniency towards each other’s failings.